How do I answer my mom when she asks to see her deceased parents? 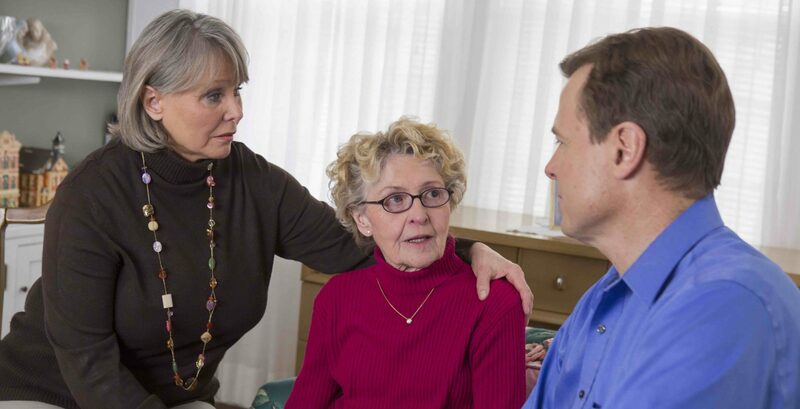 Home > Community Voices > Your Questions Answered > How do I answer my mom when she asks to see her deceased parents? How do I answer my mother when she constantly asks to see her parents who are deceased? This is a most difficult dilemma and so common. As dementia progresses in our brains, our short term memory is blocked and eventually our long term memories as well. Your Mom is not able to recognize a time frame or the fact her parents and possibly other friends and family who have passed away are no longer with us and able to visit. Seeing her ask for people she cares so deeply for can be heartbreaking. First, try to distract her with another activity or a story or music. Is she able to take a walk or look at photos? This might work, if only temporarily. You will not be able to get her to understand her parents are deceased. And if by some chance you do, she will not remember and you will begin the process all over again of reminding her. You don’t want to lie to her, but sometimes, especially if she is already having a rough day (or you are), you may need to just play along and tell her you don’t know when she can see them or she will see them soon. Other times, you might want to tackle to difficult task of explaining to her the truth. Ultimately, it is up to you and there isn’t a right or wrong answer. If she gets upset it might be best to use the distraction mode or play along. Unfortunately, there isn’t a magic answer. I am sure others have dealt with this painful situation, any suggestions for Kris? My mom will occasionally ask about my dad who has been gone 11-1/2 years. I just say he is probably home and she is satisfied. Trying to get them to understand when they just can’t grasp it is hard on us but try to agree and not argue or teach. We deal with this all the time on the memory care unit where I work. The only thing that works is to explain to them that they are spending the night with us. Maybe there was a bad storm, and we have to wait till tomorrow (by tomorrow morning they have forgotten about it). We have phoned their family and everyone is aware of where they are. Their family will come pick them up in the morning. Repeat as often as necessary. Explaining that their parents are deceased sometimes works. But, not usually. Not sure if that helps. I watched my Aunt go through this and it shocked me that she begged to “go home” even while she was still living in the same home she had lived in for sixty years. She wanted to go back to her childhood home. We distracted her with photo albulms she had put together years before. Telling her that she was already home did not help at all. My mom had a special relationship with her brother in law, Bob. My father was a POW for 19 months in WWII. If there was any news he was sent across the street with the news. When they got married and moved a town away he would visit. My Uncle was deceased. My mom came to live with me having Alzheimer’s. She wanted to know why he didn’t visit. Would get mad that I would not go get him. Told me I was lazy. Would walk away, make her tea and try to settle her with a tv program. Most times she would fall asleep. Not an easy situation. Siblings can never understand the tension you lived under. Mother had this problem. I always tried to change the subject. One time she Was adamant about this. I was tired and did not know what else to do, so I took mother to the cemetery. Huge mistake, she said that she didn’t remember attending the funeral. She was extremely upset at this point. I managed to calm her down and took her home. When we pulled into the driveway of the house she had lived in for years, she asked if this was my house. In the 5 minutes it took to get home all was completely forgotten. Mother passed 6 2015. It’s taking me a long time to put all this in perspective. I don’t believe I will ever be able to put that part of my life behind me. Lying to my mother, physically restraining her when she was convinced that she had responsibility elsewhere. Definitely not something you want to attempt Alone. siblings able to help must be convinced they must help for the primary caregivers Co own health both mentally and physically. You did not get carried away. I am dealing with this myself with my Mom and I considered taking her to the cemetery also. Glad to hear your input. I actually put a book together with all of her family’s obituaries because she accused me of lying to her and killing her brothers. This was on a very bad day, which I pray I never have to go through again. She was adamant about going home to her family house to see her parents and brothers, who are all deceased. I was very unsuccessful in distracting her on this awful day, but somehow she calmed down. This is the most difficult thing I have encountered in my life. Fortunately, I have supportive siblings but they live some distance away and do not experience the daily trials except when my husband and I take vacations. Now, I guess I’ve gotten carried away. I appreciate hearing stories and advice from those with similar experiences. I often feel alone in these struggles, although I certainly love my Mom very much. My father would ask where his mother was. We would tell him that she was out for a while but would be back later. That satisfied him and didn’t upset him. Of course he would ask again later but that seemed to work. mom recently passed she would ask if i had seen Dad today?. i would smile at her and say “ya know mom i haven t seen him today but if i do i ll be sure to tell you.” she would smile and i would change the subject. I never lied to her i d just try to divert the conversation to another topic.She s with him now. Put her off. say you’re not sure where they are right now. change the subject. distract with food, music, adventure, trip outside, whatever it takes. If her memory is that bad, she will forget and you can do the same things next time. When my mom did that, I would just calmly say, they went shopping or they are out with friends. Mom would also ask where my father was and I would always say he is with his friend John at breakfast or he was volunteering as he did many times and she would be fine with that. Another idea: “Your mom is not here right now but What a good thought. Lets sit and talk about her. What was her favorite…. ?” Get a photo, share a memory. Behind her question is a desire for her mom, not so much to be told she’s dead. What is “dead” to a dementia mind? Don’t make her more confused. Having worked with patients who suffer from various forms of dementia for more than a decade I can say that if they are asking to see deceased relatives – I will 100% tell a white lie to make their day better. The number of times we told my grandmother that her husband was deceased never got easier – it broke her heart every single time like it was the first time she heard it. I finally decided: no more. “He’s a work for the day, you’ll see him around supper time”. And that was that. She was happy for the time being, I didn’t cause her any unnecessary stress, and she did not remember that I told her a white lie. Since then I’ve taken on the role of educator for caregivers on how to work alongside those with dementia. “Join the ride” with your friends/family who are suffering this horrible disease. There is no point adding stress to their day and yours if they are not going to remember a white lie. Unless the untruth will cause them harm – go along with them and let them live in their reality. If they are refusing to have breakfast because they think they’re 20 and have to feed the chickens before they eat: tell them you’ve fed the chickens for them so that you could both have some time together. It’s better than arguing and trying to tell them that what they “know” to be real is not. Your perspective is so loving. Thank you. When my Mom asked where my Dad was, I couldn’t lie because I’d feel guilty so I just said he’s not here. Then she’d ask again where is he? I’d say I don’t know but he’s not here. I wasn’t lying to Mom and most of the time that seemed to be good enough for her. Good luck!! Hang in there!! You’re doing a great job!! My mom always wanted to visit her mother (who was deceased). I told her that we will definitely do it tomorrow and that I understood that of course she wanted to see her. By the next day, she never would remember the conversation. She would be so relieved and happy that I understood her feelings and relieved that she would see her “tomorrow.” I hated lying, but realized that it made her happy and content. I hate that it took me WAY too long to realize that! Do NOT waste time explaining that her mom is dead. . . we tell our children there is a Santa Claus- we can and should make our loved ones with Alzheimers happy with little white lies. It’s reały tough doing either; at first I thought I would be rational and explain age and numbers of why her mom wasn’t around. Later I realized it was senseless because it would upset her. Now I just go along with whatever she says, if she wants to visit someone that passed away, I would say okay we will go tomorrow. If she wants to cook for all the family that’s coming to visit her, I tell her I cooked already and we wait for the company that never shows up. It is easier and my mom doesn’t get upset. One thing that’s difficult is when she forgets I’m there and she thinks she’s alone. I just constantly tell her I’m right here mom. I experiencec this also with my mother. We keep a journal and every time my sister or I or the grandkids visit we end the visit by saying “what would you like to write in your journal about today?” Then, especially when she is feeling alone, we read the journal and she enjoys remembering, for a moment, that she has been visited and loved. My Mom would cry and ask when were her parents coming to get her, that her parents told her they are coming to get her. The care takers would tell her that her parents were dead and she would start crying. I told my mom that yes, her parents were coming to get her, but it wasn’t the right time and that they would come and get her at the right time. She said ok and stopped crying. I instructed the caretakers to tell her that, but do not say her parents are dead as that just upset her and caused her to cry. This was when she was in late stage Alzheimer’s and trying to bring her to the “present” upset her terribly, and she was past the ability to see the present time. Her mind had progressed too far back at this stage of the disease. Fortunately my mother didn’t get into this subject very often, but one night in bed she wouldn’t stop yelling for her mom to come to her. I had to play the role of her mom all night holding her in my arms and attempting to calm her anxiety. Playing the role of my mom’s mom was the most traumatizing experience in my life. I will never forget it as long as I live. Mom passed away 5 years ago and it’s still vivid in my mind. This disease is horrible! My mom is constantly looking for her mom or her baby. We’ve tried a doll but she knows it’s a doll. She won’t go eat or she won’t leave because the baby is sleeping. It’s so terrible. She thinks she lost her baby all the time and just panics. Or she has to find her mom because she has to red her. Mercy!! I have never lied so much in my life…..guilt isn’t as bad as it was because I guess lying is better than her panic. I hate everything about this! I found telling mom that my dad was work did the trick. Dad was a blue collar guy. He worked many hours overtime in his younger days. My mom can relate to that answer and it saves an abundance of tears. You learn lying to a loved one with Alzheimer’s is not a bad thing. It spares them pain and sadness and confusion. My mom had no clue that my dad had been battling cancer for years prior to his passing. For the final 6 weeks of his life, they were both on separate floors of the same hospital and she had no idea that she wasn’t living at home. They visited each other a couple times – but she actually found it very distressing because she didn’t understand that he was sick. In the end we felt it was much kinder to let my mom think that he was in the basement or out shopping. When my dad passed away we (my sister and I) chose not to tell my mom at all. Obviously this meant she didn’t attend the funeral or visitations. We felt that it would have been very mean to have her suddenly realize my dad was gone -deal with the shock and dismay – recover from the shock only to go through the same thing ten minutes later. We never regretted our decision. She asked for him for a year or so after, but was always fine when we said he was in the basement or that we hadn’t seem him today yet either, but would let her know when we did etc. She is now at a point where she only gives us one word answers if we are lucky.